Singers Drummers and Ukes! 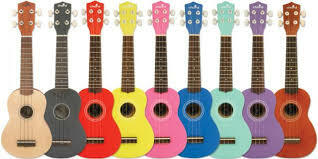 Beginning Uke Instruction K-5- also catering to simple song arrangements for intermediate students. Must have working uke and Sandy will help tune before class. Sandy will bring percussion instruments for drummers and folks that just want to sing- learn to play and sing 1, 2 and 3 chord songs. E-mailing student name, grade, and which instrument(s) you wish to work with to Sandy Buchner at sandrix1@msn.com. Please make checks payable to “Sandra Buchner”. From the 2005 Book, A Day in the Life of the American Woman, Sandy Buchner was deemed the rock star of the under-7 set. Sandy has lived and worked as a Musician, Children’s entertainer, Recording Artist, Music Specialist and Clinician in Seattle since 1990. Currently she is teaching at Greenwood Elementary School in Seattle, as well as a handful of other after school choirs and childcare centers. She is a guitarist, stand up bassist and singer in the rockabilly grunge/grass band, Randy Hicks Band. Check out her new cd on www.reverbnation.com/sandybuchner...it is currently #1 on the Reverbnation Charts for Children’s’ Music!